Palm Sunday or Passion Sunday leads Christians throughout the world into the celebration of Holy Week. Let us be united in our prayer and celebration during these sacred days. 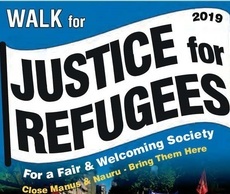 A number of Brigidines will be involved in a Walk for Justice for Refugees on Palm Sunday. Those unable to attend a Walk in their city are invited to pray on this day for the millions of children, women and men who are still seeking asylum and a safe place in the world. Pray too for those who advocate for the dignity and basic rights of people forced to leave their homelands and who support them in finding refuge in a safer place.